Přírodní škola (the Nature School) was founded in 1993 as an alternative to the big state gymnasiums. The philosophy of our school is that it should be life itself here and now, not a mere preparation for future career. We want the school to be a place where everyone finds a place of their own and realizes their potential regardless of age, talent or interests. We put emphasis on a community where people live together and which is at the same time open to others. Small and integrated group of people in friendly atmosphere. Maximum capacity of the school is 70 students. 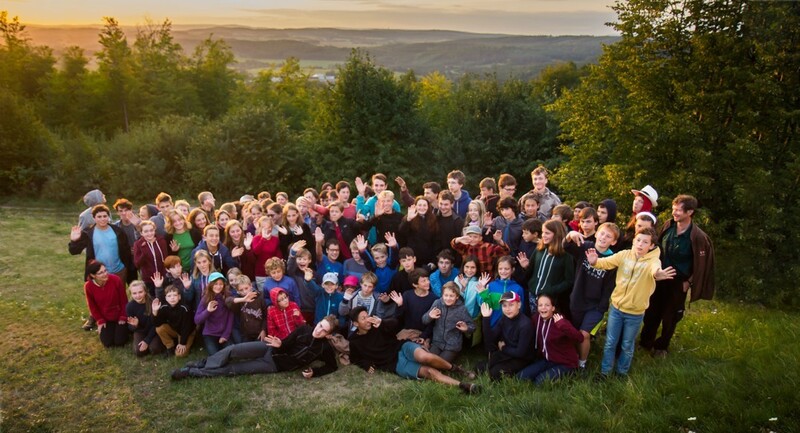 School excursions – the whole school frequently leaves Prague for a couple of days. These excursions cover some 6-8 weeks per school year. Maximum participation of students in the organization of the school (self-administration, lecturing training, system of patrons for younger students). Freedom of choice within individual activities and programs and the participation of each member on the decisions of the whole community. If you are interested in functioning of the student council, click here. Specific system of examination and evaluation (a system of partial exams, the so called conditions and credits) in which the students themselves to a significant extent determine their own specific way of reaching the didactic and educational goals, and thus become active participants in their own formation. Complex and long-term research projects oriented towards research (the so called expeditions) or artistic creation (mostly theatre or music) carried out by small groups consisting of students from different grades. The theme is chosen by the students themselves. Common goals for the whole school-team reached by the cooperation of children and teachers as well as partners of the school. Emphasis on generally beneficial goals which reach beyond the framework of the school as such – collaboration with a children home, workshops lead by students and teachers for children from other schools, research activities in regions, organization of various meetings, cultural events, publications etc. > More details about our school in OECD material. The Natural School was acepted among the most innovative OECD schools in 2012 (as the only gymnasium in the Czech Republic). From 2018 we are a Faculty School of the Faculty of Natural Sciences of Charles University.